Nebraska Children houses Prevent Child Abuse Nebraska (PCAN), our state's chapter of Prevent Child Abuse America (PCA). PCA is a national organization dedicated to promoting the healthy development of children through state chapters, public awareness, and advocating for national changes in policy that promote a nationwide prevention network. They provide outreach materials, research, evidence-based prevention practices and training to help us and the statewide community councils maximize effectiveness in implementing prevention programs. In 2008, Prevent Child Abuse America introduced the pinwheel as the new national symbol for child abuse prevention through Pinwheels for Prevention®. What PCA research showed, and what experiences since then have borne out, is that people respond to the pinwheel. By its very nature, the pinwheel connotes whimsy and childlike notions. In essence, it has come to serve as the physical embodiment, or reminder, of the great childhoods we want for all children. Prevent Child Abuse Nebraska promotes pinwheel gardens and other activities throughout the state for Child Abuse Awareness Month each April. Prevent Child Abuse Nebraska is a partner in the new statewide prevention initiative Bring Up Nebraska. It is a statewide effort that provides a framework for local organizations in local communities to form a collaborative to help prevent problems from becoming a crisis for local families. Complex issues need collaborative solutions. 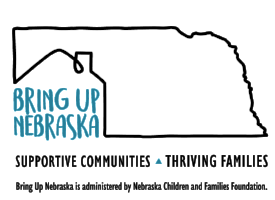 And with Bring Up Nebraska, we believe local communities are best situated and most motivated to understand their own needs and strengths as they relate to identifying these solutions. In addition, we know getting a family with a problem connected to a local agency can prevent a crisis that results in entry into the child welfare system or other higher systems of care.